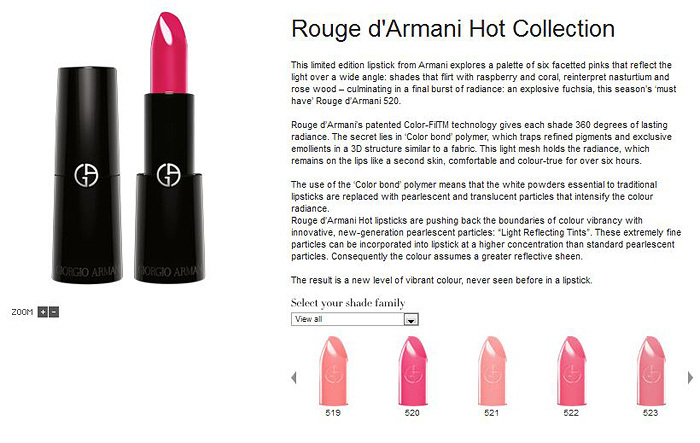 I don’t usually fire out many lust posts but I had to share my OMGWANTITNOW for the new Rouge d’Armani Hot Collection. I’d been sorta thinking about (trying not to think about) it for a little while… but Karla’s swatches, oh my… the swatches. Yeah.. whatever… I was talking about the SWATCHES <<<< click this link and be prepared to want one. Want one? I want TWO. I always seem to fall in love with Armani Limited Edition items and I swear that the counter in Selfridges has the worst stock levels of any counter, ever. Wish me luck on Wednesday, I’m taking L into the big city and if I don’t come back with one of these beauts in my hot little hands, I won’t be a happy pink-lipstick lover. Do you have a favourite from the line up? OMG! The swatches are amazeballs! Eeeek… do I need another pink lipstick? Hmmm..
they’re good! I have a couple too and Am Liking! Shush! I don’t want to know. I have far too many expensive pink lipsticks already! Why don’t cosmetic companies or online retailers swatch for their online offerings. They would do so much more business if they did. I live in the sticks so its difficlt to visit a counter to see the products and the online colour charts are rubbish. One of the reasons I love this site is the swatching closely followed by the cookery articles. Oh man oh man. xD Barbies of the world are going to be headed to the armani counter. I have far too many pink lipsticks. I can’t even look.